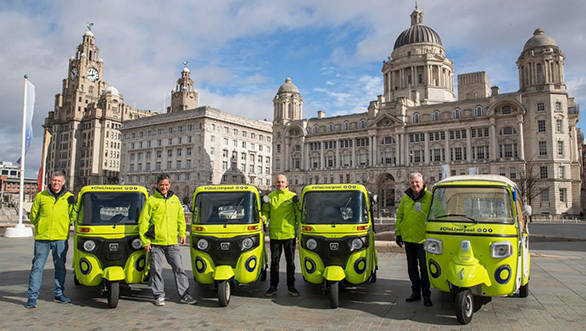 The India-based ride-hailing company Ola launched its Liverpool operations with a fleet of Bajaj and Piaggio auto rickshaws. 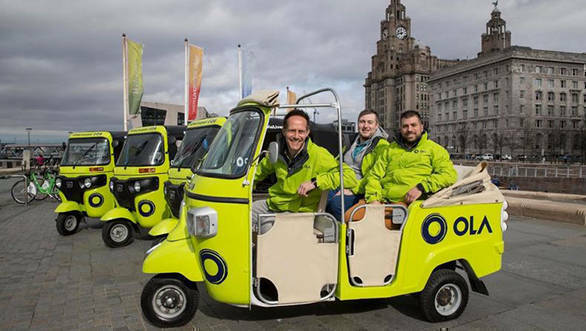 The ride-sharing taxi app started off its promotional launch event in Merseyside County with drivers wearing neon-green jackets ferrying passengers in same coloured Bajaj and Piaggio "tuk-tuks" free of charge around Liverpool city centre. Liverpool is the fifth city in the UK for Ola after the ride-hailing service was launched in August 2018 in Cardiff, expanding to Bristol, Bath and Exeter in the later part of 2018. Ola is planning on aggressive expansion to take on Uber, its biggest rival and market leader globally. Ola's strategy in the UK follows a different approach, focusing on driver empowerment. Ola says it will pay a larger share of the fares to its drivers compared to Uber, charging only 10% commission compared to 25% charged by its competitors. Ola will also be benefitted by being the only app that can be used by both black cabs and private hire vehicles. Ola black cabs do not peak, which means they will be cheaper when other private hire vehicles are in high demand. Ola aims to increase access to taxis for customers by offering lower rates along with greater choice. It is also offering a 50% off on the first ride for customers downloading the app before April end. Ola plans to expand to several other cities across Northern England in 2019.